As China grows more powerful, it is slowly displacing a decades-old American preeminence in Asia and then Africa. The new trade war between the two global economy powerhouse outlines the rivalry that soon will define the future of African continent. 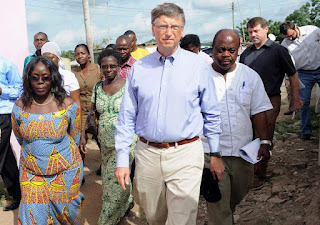 Historically, the African natural resources have been plundered by the foreign powers, mainly but not exclusively European, who extracted easy-get resources available in a political vacuum resulting from the corrupted African elites. Ludo De Witte, an author of a book called Lumumba’s murder the most terrible assassination of the 20th century. The killing that was carried out with the joint complicity of the American secret service and Belgian governments, which used Congolese accomplices and a Belgian execution squad. Since that assassination happened this forever changed the African continent’s political landscape and its economic and political prospects. The westerners tended to be very wicked and brutal in their approach when handling African domestic affairs. The amount of money the US invests in Africa appears to be waning, even under the Obama administration, who committed over $3.1 billion in a consecutive three-year period to an initiative programs that claimed to address African power shortages. In all honesty, Obama spent more money on drone-projects bombing the continent than any US President has ever spent. China’s approach is different from that of the traditional colonial powers that ever seeking to plunder African resources through long term deceit. China too is also after resources, but its main interests in the African continent are twofold: Searching and exploiting oil and mineral resources, and creating new markets for Chinese goods. In addition, the Oriental nations spent billions investing or repairing infrastructure that provides jobs for Chinese nationals, the technicians and cheap laborers, mostly consist prison inmates who working on the pardoning-parlor of the Chinese government. However, unlike other big powers, China has shown relatively minimal interference in the domestic affairs of African countries, while at the same time providing generous aid and loan packages to African states for investment exchange. As Clifton Pannell, Director of the Center for Asian Studies at the University of Georgia said. 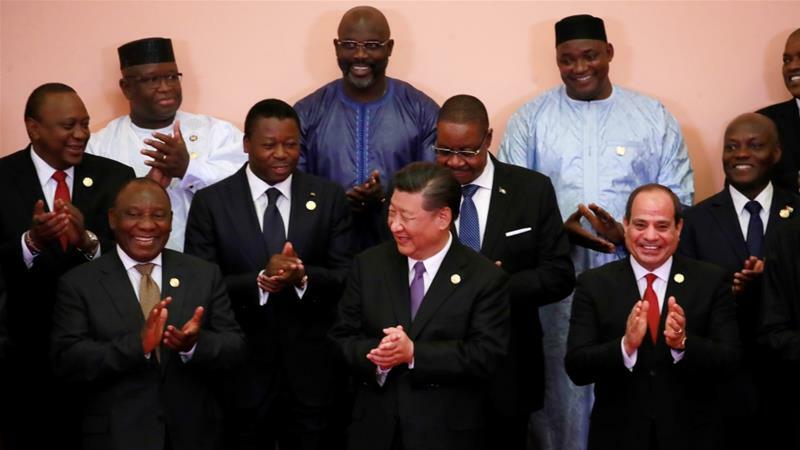 While China's cooperation the continent has some mutual benefits that usher solidarity toward African states as opposed to colonialism and economic dependency created by unfriendly westerner's capitalistic stance. Although, not every African is happy about China’s presence on the continent, there are strong sentiments that China employs few Africans in some of its economic endeavors, while many local factories, business entrepreneur and construction companies have been threaten and some already bolted out from the market since can't match up against China’s competition. China, however, has a steady policy of providing assistance and training in agricultural techniques and public health through state sponsored scholarship programs. During 2018 Beijing Summit of the Forum on China-Africa Cooperation which took place in Beijing,President Xi Jinping unveiled eight major initiatives which included purchasing more African goods and encouraging Chinese companies to expand investments to promote industrialization in Africa. Other major areas of cooperation are energy, information, transportation and use of water resources. To ensure the proper development of these initiatives, China will provide $60 billion in support for Africa’s development. Mr. Xi Jinping encouraged African countries to join in building the Belt and Road Initiative to achieve common developmental goals. In the financial area, China promised support through the Asian Infrastructure Investment Bank, the New Development Bank, and the Silk Road Fund. In addition, Xi Jinping pledged to provide 50,000 government-funded scholarships for African youngsters and invited 2,000 of them to visit China. 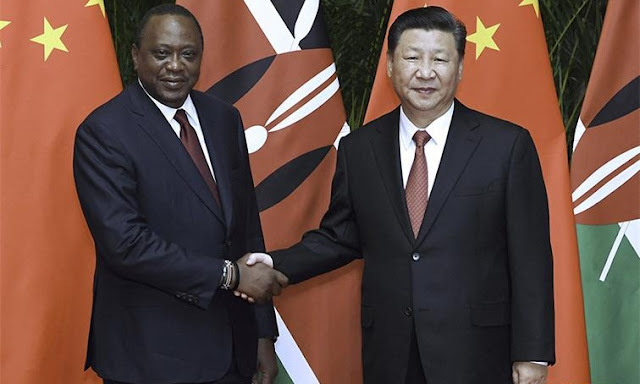 President Jix Jinping and Uhuru Kenyatta hold hands to deepen their cooperative partnership. Medical aid: China’s medical aid to Africa started a long way in 1963 during African liberation struggle when the Red Army sent about 100 healthcare workers to Algeria after it gained independence from France, and has been steadily increasing its numbers since ever then. By 2014, China was spending about $150 million annually in medical aid to African countries, first African doctors were trained in China and Cuba. China now ranks among the top 10 bilateral global health donors to the continent. Although the exact number is unknown, China has dispatched several Chinese medical teams (CMT) to Africa and assisted in the construction of health facilities and training of African healthcare workers. It has also provided medical equipment and drugs. It is estimated that by 2014 China had helped build 30 hospitals and 30 malaria prevention and control centers, and trained over 3,000 healthcare workers from several African countries. Malaria is one of the main diseases the Chinese are trying to help prevent and control. China has donated over $26 million in anti-malarial drugs to 35 African countries. China also provided important aid to control the Ebola epidemic that killed more than 11,000 people between 2013 and 2016 and has helped in the prevention and control of HIV/AIDS and other infectious diseases. In its medical aid to Africa, China makes use of its own experience as a developing country, limitations and advantages included. 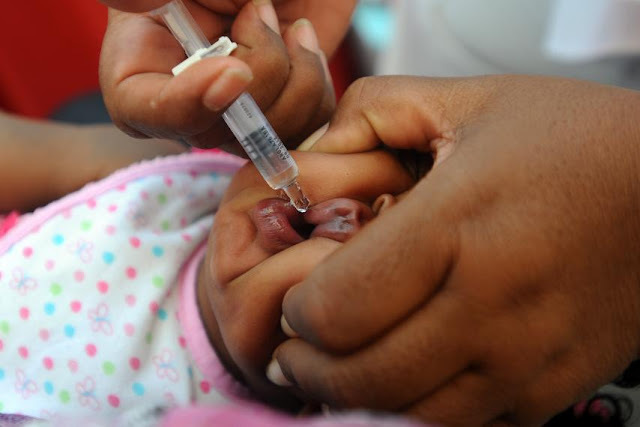 At the same time, China uses its assistance in public health to strengthen its diplomatic relations with African governments. Military Assistance: Although in the past China mainly targeted economic trade and assistance to Africa, Beijing is increasingly developing policies aimed at strengthening military ties in order to gain a stronger geopolitical influence and expand weapons sales in the continent. In that regard, China has been extremely active in selling small arms and light weapons to several African countries. President Xi Jinping promised to provide $100 million of free military assistance to the African Union to support the establishment of the African Standby Force and the African Capacity for Immediate Response to Crisis. In addition, the Chinese government has invited thousands of African military officials to China for workshops and training courses. “The concern from a lot of partners is exactly what role China is going to be playing in the region and how it is going to exist with existing military organizations and security forums,” said Duncan Innes-Ker, Asia Regional Director at the Economist Intelligence Unit. Tensions between the US and China just keep rising to another level, which the global protectionism and double standard of America instills fears. Last week, for example, US vice president Mike Pence made a speech laying out the Trump administration’s case for an all-out economic confrontation with China, beyond its current tariffs on Chinese goods. But does the White House have the upper hand? Of course not! Imposing economic sanction on Chinese assets can't even bring a satisfactory effect to US let alone it will bring self harm. 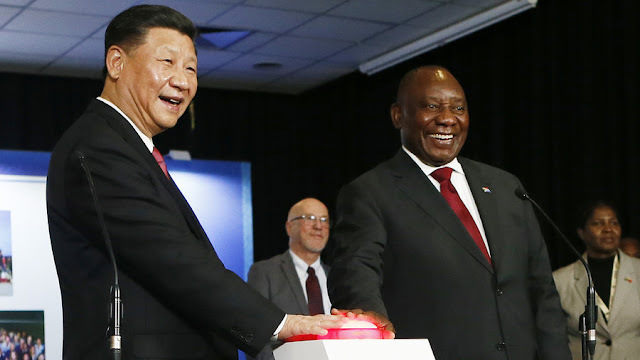 The only alternative is to target African states with economic sanctions those accepting Chinese aid, this is the only available solution for them to counter the grow of China on the continent. In New York Times' column written by Andrew Ross Sorkin points out that China does have a “Nuclear option” in its arsenal: So, US will not choose to confront China militarily in a direct way, beside creation and sponsoring internal rebellions and terror factions in African countries to destabilize the peace in the continent. 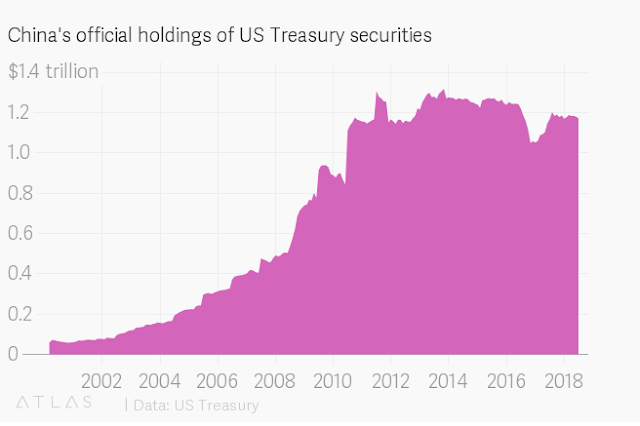 The notion of a Chinese “nuclear option” goes hand in hand with the idea China has lent the US money—or as Sorkin puts it, the idea that, in the US-China relationship, China is indeed the biggest foreign holder of US government debt, with nearly $1.2 trillion in US Treasuries. 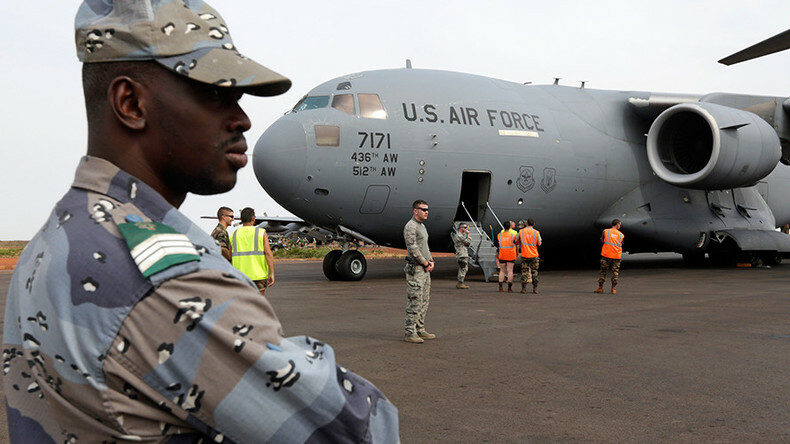 The tempo of American involvement in Africa has increased since ever. In January 2007, the American AC130 gun-ships flew over the continent and in the next month, Pentagon announced the creation of a dedicated African Military Command, AFRICOM. This immediately raised the question: Will Africa become a platform for international terrorist activities and what is the mission of the United States to have a military base in every African state? Some security expert speculate that the creation of Africom that goes along with the secret funding of opposition movements and NGOs for regime change, has nothing but a manufacturer of continental terror outfits and regime change on the continent. Pentagon is well known with its unofficial operations in Indonesia conducted by the CIA that covertly arming insurgencies and radical movements while at the same time serve US government attempt to provide military solution to the same problem they have created in the first place. Countering America’s Adversaries Through Sanctions (CAATSA) is a new federal law, promulgated in 2017 to counter any country with an economical sanctions. The Act passed by US Congress last year. In simple word, if any country or any group active in that country tries to harm american interests or acts against america. As per the provisions in this act, the sanctions are already imposed on countries like Iran, DPRK, Russia and now then the US considering to add China and its trading partners. The recent upheavals in the Sahara - an upsurge in jihadist activity, a military coup in Mali and the French military’s action to counter terrorism in the deserts of Gao and Timbuktoo - have put the region in the international spotlight. As the 21st century begins, northwest Africa has become an important flash-point in the Global War on Terror as well as the fierce competition for the continent's valuable natural resources. Malian gendarme stands guard after the arrival of a U.S. Air Force C-17 Globemaster III plane with French troops at the airport in Bamako. Donald Trump’s trade war with China is becoming more problematic as China's relations with the African continent is growing. The United States has initiated trade war that affecting a broad range of countries and again faces a retaliatory threats from China, the European Union and among others. Our modelling suggests that if current trade policy threats are realized and business confidence falls as a result, global output could be about 0.5 percent below current projections by 2020,” the International Monetary Fund’s Maury Obstfeld said earlier this month. China, is Africa’s largest trading partner. Trade between Africa and China has grown from $765 million in 1978 to over $170 billion in 2017, and is soon expected to reach $400 billion. According to the United National Conference on Trade and Development (UNCTAD) World Investment Report of 2018, China was the fourth largest foreign investor in Africa in 2016, spending about $40 billion. It wasn’t all too long ago that President Trump openly calling African nations “shithole countries” – a remark that left a chilling void that China can quickly fill up. From 12-16 January 2018 the Chinese Foreign Minister Wang Yi visited four African countries: Rwanda, Angola, Gabon, and São Tomé and Príncipe resulting the US announcing to impose sanction against African nations who trying to be against trading policy. The major point of difference between China and the US is that while Donald Trump openly insults Africa, China has made a point of including anyone and almost everyone in its plans to develop Africa.Chinese president from visiting these three nations recently in an attempt to portray China as a partner for Africa’s industrialization. Whereas the US makes a point of targeting and showing interest in countries only when they have resources that can be extracted to benefit a select few, China may in fact be demonstrating it can listen closely to Africa’s aspirations instead of US. Mr. Bolton announced a new program, “Prosper Africa,” to support American investment across Africa. Without attaching a dollar figure, he said the United States would facilitate alternatives to the large, state-directed public works projects pushed by the Chinese. Those projects, he said, were turning some African countries into economic vassals of China. Zambia, for example, owes Beijing $6 billion to $10 billion, according to Mr. Bolton, and is at risk of having the Chinese take over its national power company. China built a military base in another indebted African country, Djibouti, a few miles from where the United States has a base for counter terrorism operations. Earlier this year, Mr. Bolton said the Chinese fired military-grade laser beams at American aircraft, injuring two pilots. Experts welcomed the focus on Africa, which has often been neglected by both Republican and Democratic administrations. But some noted the contradiction between Mr. Bolton’s promise of increased investment and a rollback of American engagement in other areas. Grant T. Harris, a former adviser on Africa to President Barack Obama. “Washington needs to understand that China is investing in relationships, not just infrastructure.” Mr. Trump famously asked why the United States should accept African immigrants, belittling their countries with an epithet. 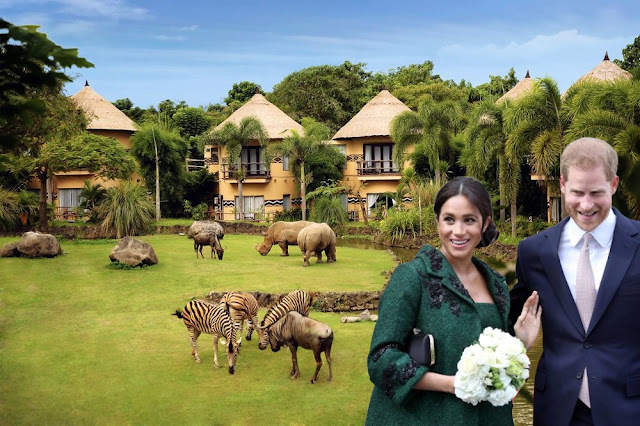 The first lady, Melania Trump, made a four-country tour of the continent in October, which drew more attention for her wardrobe — particularly a colonial-style pith helmet on a safari in Kenya — than for her encounters with Africans. 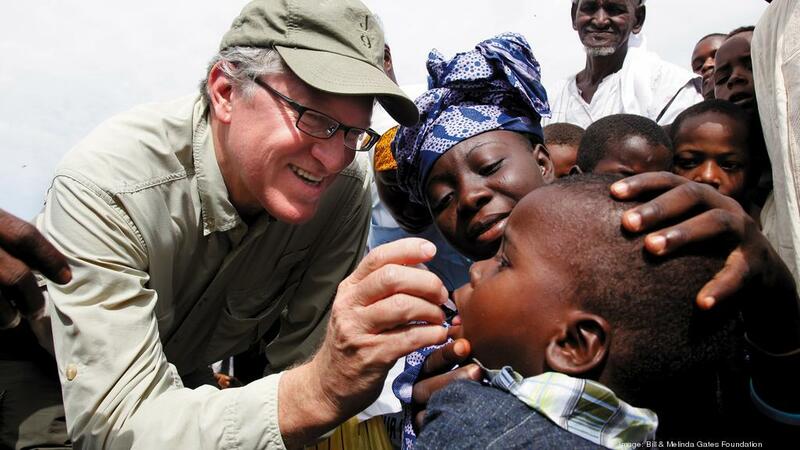 Mr. Bolton traced his interest in Africa to his first job in government, working at the United States Agency for International Development during the Reagan administration. Yet he made clear that he viewed much of the American aid sent to Africa as wasted or misspent. “From now on,” he said, “the United States will not tolerate this longstanding pattern of aid without effect.” South Sudan, where rival leaders recently agreed to end a ruinous civil war, is among those at risk of losing aid. Mr. Bolton said the country was still being led by “the same morally bankrupt leaders” who prolong “horrific violence and immense human suffering.” In the 2017 fiscal year, foreign assistance to Africa from the State Department and the Agency for International Development amounted to $8.7 billion. From 2014 to 2018, the United States provided some $3.8 billion in humanitarian aid to South Sudan and its neighbors. American businesses invested $50 billion in Africa in 2017, according to the State Department. The flow of money from China to Africa has been substantial, but much of it is not what experts consider aid. From 2000 to 2014, Chinese financing to Africa totaled $121.6 billion, according to an analysis by AidData, a research center based at the College of William & Mary in Virginia. The US already enacted sanctions on Rwanda’s earlier this year, when Rwanda ceased to use clothing and shoes from America in order to try and boost its own local manufacturing. Soon African nations that cooperate with China will blacked listed in terms of Section 231 CAATSA.